Once known as Assabet Village, Maynard is located 25 miles west of Boston. 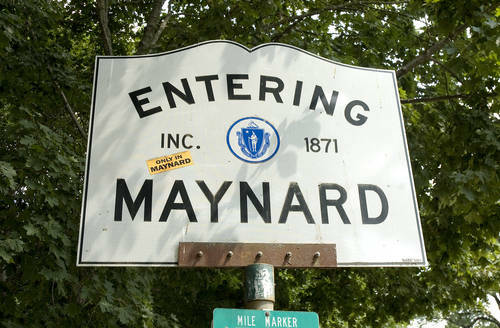 A small town spanning only 5.4 miles, Maynard holds a population of just over 10,000 people. Like many New England towns, Maynard maintains a rich history, specifically in the textile industries, noted as making the highest percentage of wool for U.S. military uniforms during the Civil War. One such mill, known presently as Mill & Main, though derelict for many years, has recently been renovated and now houses a variety of businesses as well as the oldest, still working, hand-wound clock in the country. Though many towns in the area have regionalized school districts, Maynard has three public schools for students residing in the town: Green Meadow School, serving grades Pre-K through 3, Fowler School, serving grades 4 through 7, and the newly built Maynard High School, serving grades 8 through 12. While at the elementary and middle school levels students have the opportunities to participate in well-rounded educational programming, high school students have the ability to enroll in STEM courses in engineering, AP dual enrollment classes, and various extracurricular sports programs. The town also houses one private school, the Imago School, which offers a classical Christian education program for grades K through 8. Known for its affordability, Maynard presents a wide variety of variety of housing options. Coming in at an average price of just over $380,000, homes in Maynard tend to run the gamut in architectural style. From apartments and condos to larger, single family colonials, the housing prices in the town are lower than many of those in the surrounding towns.